In 1927, the US Navy floated a small tin hanger down the Detroit River, planting it on a grass airfield at the southern tip of Grosse Ile, Michigan. This established one of the nation's largest and most important bases for training young officers in the art of flight. 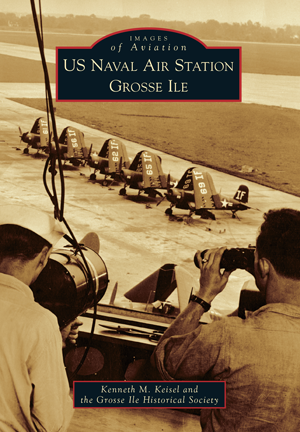 Nestled among farms and lavish estates, Naval Air Station Grosse Ile (NAS GI) was home to thousands of Navy officers earning their wings before leaving to fight in World War II . Here their story is told through photographs taken by the airmen who flew and lived there, from its beginnings in 1927 to its decommissioning more than 40 years later. This is the story of men such as Pres. George H.W. Bush, who flew torpedo bombers from NAS GI. And this is the story of the ZMC-2, the Navy's only all-metal blimp, constructed at NAS GI. Finally, this is also the story of the current NAS GI. Spared the fate of many decommissioned bases, today Cessnas, Pipers, and Mooneys rest in the same hangars where Corsairs and Phantoms once prowled. Private pilots take flight and land via NAS GI's unmistakable triangle of runways, and students still earn their wings from the same concrete runways where young airmen trained before heading off to fight the Battles of Midway, Coral Sea, and Leyte Gulf.